Measure exempts nonbank financial institutions from stress tests — scenarios to assess the stability of assets held by managers and banks — which Poliquin says do not necessarily fit mutual funds or other assets. For U.S. Rep. Bruce Poliquin, it is the little things that count. The sorts of bills often ignored. The stuff that is not flashy. The second-term Republican from Maine’s sprawling 2nd District convinced the House on Tuesday to pass easily a measure that would exempt most nonbank financial institutions from the stress tests required under existing federal law. “This is going to be a great day for America, a great day for Maine,” Poliquin told colleagues shortly before they approved the bill, one of a half dozen he’s pushed through the House in this session. Complicated stress test scenarios that try to assess the stability of assets held by managers and banks, the lawmaker said Tuesday, do not fit every type of institution. Calling the existing law “costly, cumbersome and unnecessary,” Poliquin told colleagues that changing the “one size fits all” law benefits everyone who relies on mutual funds and other places where people put their money besides banks. The extra testing adds costs that aren’t needed, he said. “The higher the expense, the lower the rate of return,” Poliquin said. What that leads to, he said, is a smaller nest egg. U.S. Rep. Jeb Hensarling, R-Texas, said on the House floor that Poliquin “changed his bill many times” to win over a broad coalition in the House, including working out an agreement to win over U.S. Rep. Maxine Waters, D-Calif. Poliquin said he “really appreciated” her willingness to work with him on details of an amendment she sought. The stress test legislation is typical of the far-from-the-limelight topics that Poliquin has pushed since entering Congress after the 2014 election. Another of his bills, aimed at spurring economic growth in Old Town, passed in both the House and Senate this year. It’s on its way to President Donald Trump’s desk this week. All told, Poliquin has pushed through six bills in his second term, an unusually productive tally for a member of Congress who hasn’t been around long. Perhaps not surprisingly, his Democratic foes are not impressed. “Six bills in three and half years makes one wonder how Mr. Poliquin spends his time fighting for working Mainers,” said Craig Olson, one of four Democrats vying in the June 12 primary for the opportunity to challenge Poliquin the general election this fall. “It appears as though he doesn’t venture much outside his wheelhouse, handing another win to Wall Street interests that feed his campaign coffers by easing Dodd-Frank restrictions put in place during the bailout,” Olson said Tuesday. St. Clair said that “if Congressman Poliquin wanted to be productive for Mainers, he wouldn’t have voted to take health insurance away from more than 100,000 Maine people” with his vote last year to repeal the Affordable Care Act, a move squelched in the U.S. Senate. Poliquin sought to pursue a more market-based health care system, expressing concern that the ACA was in danger of collapsing. Poliquin has argued consistently that his focus always has been on getting more jobs for Maine. 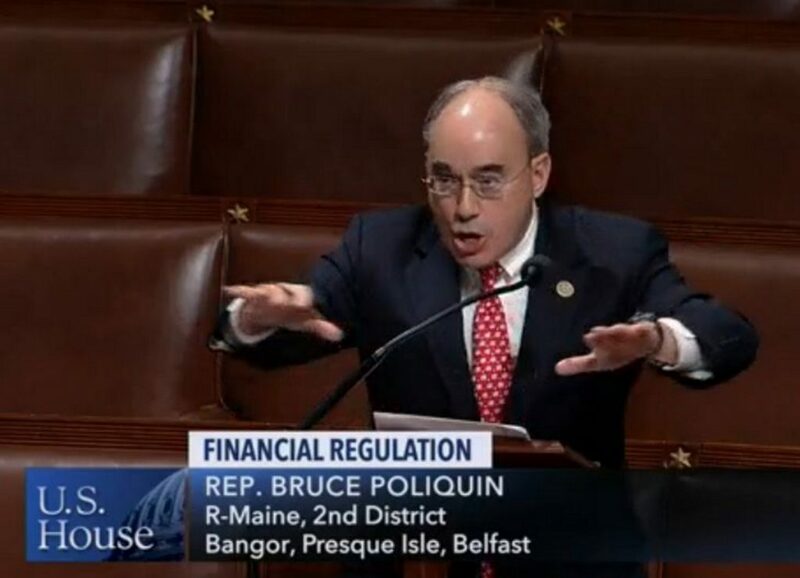 In addition to the stress test measure that passed Tuesday and the proposal to help Old Town, Poliquin has shepherded four other bills through the House in the past year. All four of them awaiting action in the Senate. One seeks to clarify boundary issues at Acadia National Park that have affected clammers and wormers. Another would ensure that veterans buried in Native American cemeteries receive headstones from the federal government. Poliquin also won support in the House for a bill that would publicize the assets held by Iranian leaders, a proposal the Trump administration has said is unconstitutional. The other bill approved by the House would require the Securities and Exchange Commission to help small businesses access capital markets. With strong backing from Maine’s two senators, Republican Susan Collins and independent Angus King, who introduced a companion bill, the measure removed an obsolete deed restriction on a parcel of land next to the Old Town Airport, allowing development on the parcel that could bring new jobs to the area. “Nothing is easy to get done in Washington and I’m thrilled that through hard work and strong will we were able to get this across the finish line,” Poliquin said in a prepared statement. Poliquin’s office touted his record by comparing it with that of former U.S. Rep. Mike Michaud, a Democrat, who successfully passed 11 bills in his 12 years in Congress, two of them renaming rural post offices. His predecessor, U.S. Rep. John Baldacci, a Democrat, didn’t get any bills passed, Poliquin’s office pointed out. Poliquin also has focused attention on issues outside of Capitol Hill but important to his district. He helped to convince the International Trade Commission to rule in favor of Maine companies challenging unfair foreign competition. The congressman lobbied successfully last year in cases involving Auburn Manufacturing in Auburn and Columbia Forest Products in Presque Isle. Brent Littlefield, Poliquin’s campaign consultant, said that even in his first term, the rookie member of Congress succeeded in getting a bill dealing with child care signed into law by President Barack Obama. Poliquin also secured amendments to other measures that helped Maine paper manufacturers and provided more funding for closed military bases, Littlefield said.